The island of Kalymnos is one of the most interesting islands of the Dodecanese. The island is also sometimes called "Nisi ton Agalmaton" (Island of Statues), because it has many statues that were created, at their own expense, by the Kalymnian sculptors Mixhalis Kokkinos and Irini Kokkinou, and offered to the local community as a tribute to their birth place. It is probably most well known, however, as the island of sponge fishermen. And today, it is becoming almost as well known as a rock climbing destination!! Its coastline has some beautiful beaches, some pebbled and some sandy, the nicest ones being on the west coast of the island. Some of the beaches have a variety of organized water sports, including water ski, windsurfing, peddle boats, kayaks and canoes, especially around the area of Massouri. One of the prettiest beaches on the island is Platy Yialos, set at the base of a cliff and looking across to the tiny islet of Ag. Kyriaki; it’s very popular with local families and weekend visitors, but quiet during the week. Further north is the beach of Emborios, a very quiet area with three beaches and no organized activities, but with a few good tavernas. If you would like to escape the crowds and organized beach sports, then these are just two of the places to go! In an advantageous position, the hotel combines beachfront, swimming pool, and a short walk to village restaurants and shops. 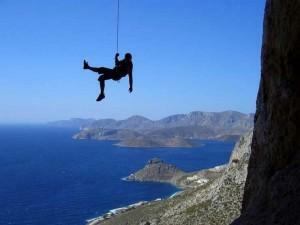 The location of this hotel is not far from some of the best rock climbing areas of Kalymnos. The bungalow-style accommodation is well-equipped, and the hotel has a large swimming pool in an idyllic garden setting.